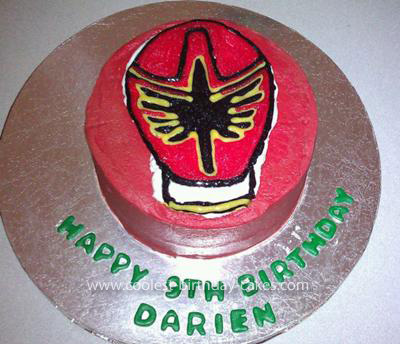 I made this Red Mystic Power Ranger cake for my nephews 9th birthday. I made a chocolate fudge boxed cake mix and filled it with chocolate buttercream. I then made a chocolate buttercream crumb crust which I left to crust overnight before covering with red tinted buttercream. I used Wilton no taste red and refridgerated overnight so that the true red could show up. I made the power ranger by using the frozen buttercream transfer method. I watched a video on Youtube which made it so easy to follow. 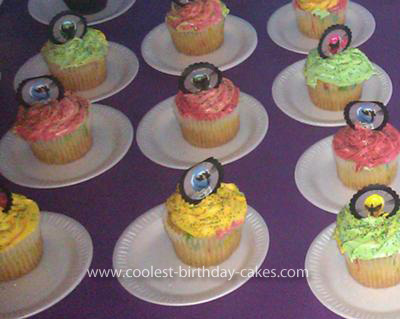 Then I traced over the buttercream with Wilton gel color writers. I used the fondant cutout letters/numbers to make the Happy Birthday on the cake board. I also made cupcakes to match the colors of the other power rangers (yellow, green, blue and pink) I made funfetti cupcakes to tie in the theme and used store bought vanilla frosting which I flavored with unsweetened Kool-aid drink mix to match the colors (lemonade for yellow ranger, rasberry for blue ranger, etc. )then sprinkled with colored sugars to match. The kids and adults loved the cupcakes and the frosting was so delicious the sour of the kool-aid balanced with the sweet frosting made for a really yummy sweet and sour treat. I also made cupcake toppers using the circle and scalloped punch cut and hot glued them onto the lollipop sticks.